ching at least once a year. 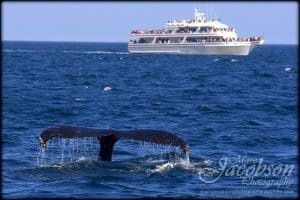 It’s always fun to go with a friend who has never gone because it is an amazing experience and I love to share it with someone who is whale watching for the first time! 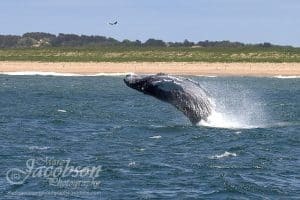 As an Innkeeper, a lot of guests ask questions about whale watching so I thought I would provide some info that may be helpful if you are thinking about coming to Cape Cod and trying to decide if you should go whale watching. For Cape Cod, the best time to go on a whale watch is from April to October. In the colder months, whales migrate to warmer locales such as the Caribbean to mate and to give birth. Then they return to the Cape again! There are several types of whales that make Cape Cod their home. Humpback whales are the most common and they weigh about 37 tons. Humpbacks are powerful swimmers and use their massive fin tail to breach (leap out of the water) and it is an awe inspiring sight to behold. We also have finback whales, minke whales, right whales and pilot whales. You may also see dolphins and seals while you are on the search for whales! Why do whales vacation on Cape Cod? Cape Cod is one of the most popular vacations spots in the United States for humans, so why wouldn’t whales want to vacation here as well? OK, maybe that’s just one reason. The other reason is that the waters off of Cape Cod provide a feeding ground buffet of fish, krill and plankton. Humpbacks can eat up to 3,000 pounds of food per day! 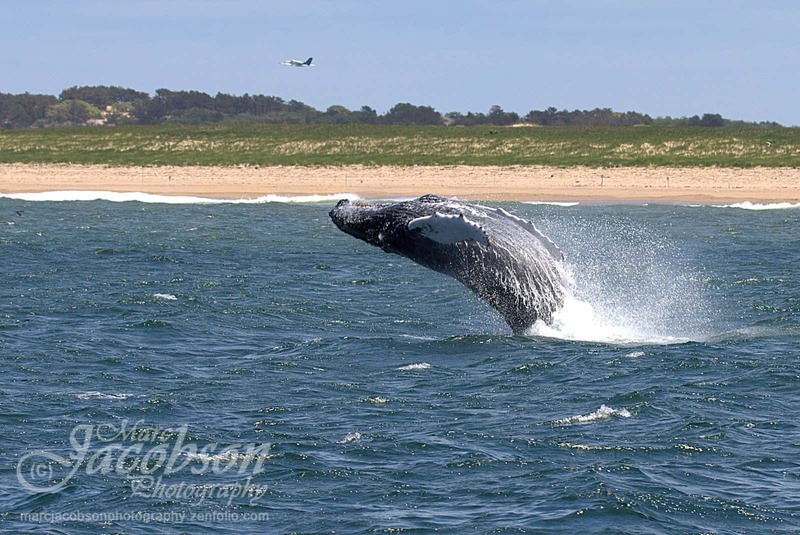 Where to go whale watching on Cape Cod? There are two main whale watching companies on the Cape and they both go to the same areas to see whales. Hyannis Whale Watch leaves from Barnstable Harbor (5 ½ miles from the Long Dell Inn). Or you can drive up to Provincetown and take the Dolphin Fleet from the Pier. 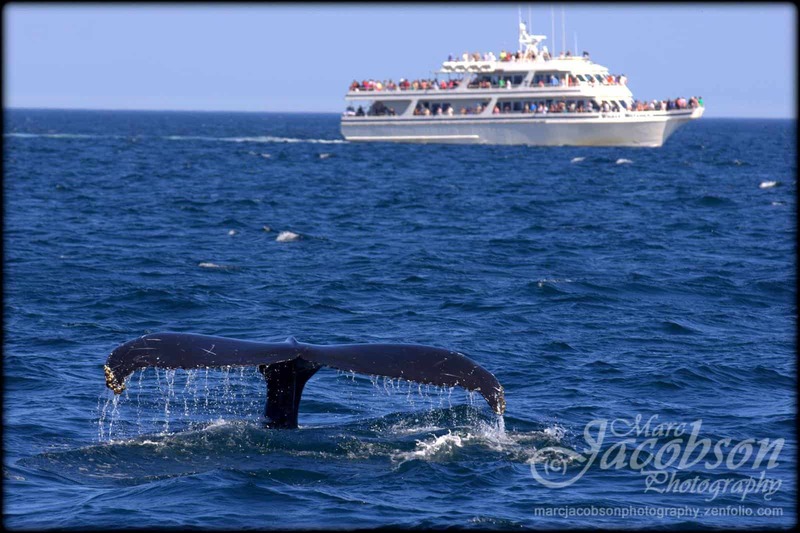 Both companies have naturalists on board so that you can learn about the history of some of the whales you’ll see. The naturalists can identify specific whales by the markings on their tales. During busier months, you should definitely make a reservation. You can contact them directly or we can call to make the r eservation for you. Definitely wear sneakers and bring a sweatshirt or windbreaker depending on the weather. Bring some sunscreen because you will be outside for a couple hours. Do not bring a baseball cap as they are known to fly off heads during the journey. You can bring food and drinks with you or you can buy some food on board the ship. Remember to bring some sea sick meds if the sea if rough. And most importantly, bring your camera (or phone or tablet) to document this amazing experience! Where should I stay while on Cape Cod? We will provide you with a comfortable place to sleep, a scrumptious breakfast, and we will help you with your itinerary so that you can make the most of your Cape Cod vacation. 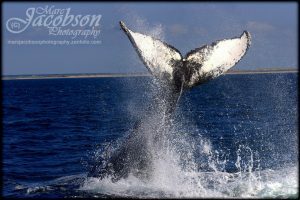 And of course, we can assist you in making your reservation for whale watching on Cape Cod! ← Shouldn’t Every Day Be Earth Day?